Sen. Lindsey Graham is throwing a Hail Mary to reopen the government. 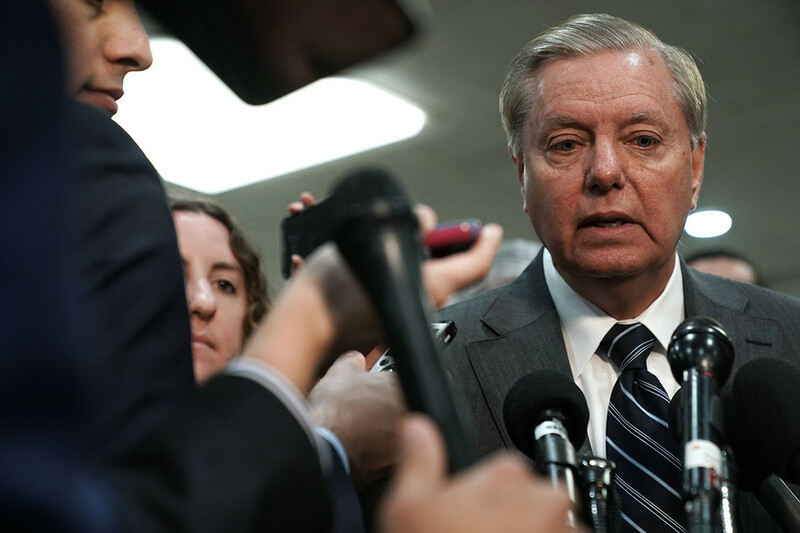 Graham brought together a half dozen Republican senators Wednesday afternoon in a last-ditch attempt to resolve the three-week stalemate before President Donald Trump deploys an explosive emergency declaration to build his border wall. The Republican senators were joined mid-meeting by White House emissaries Jared Kushner and Shahira Knight, the president’s congressional liaison. Democrats were not invited to participate in the meeting, which largely comprised of centrist Republicans, including Sens. Rob Portman (R-Ohio) and Susan Collins (R-Maine). The participants emphasized that the discussions were preliminary in nature, but some of these senators are scheduled to meet Thursday with Senate Majority Leader Mitch McConnell to continue the discussions, according to congressional sources. A deal could prevent Trump from declaring a national emergency in order to build a wall on the U.S.-Mexico border, a prospect he has dangled as a way of resolving the shutdown without caving on a central campaign promise. Yet the group did not include many Republicans that are in Trump’s corner in the shutdown fight; instead it was largely veteran bipartisan dealmakers. Most Republicans are wary of trying to do anything without the president’s explicit go-ahead. But Sen. Lisa Murkowski (R-Alaska), who attended the meeting, said there is an appetite for a deal. “What you should be aware of is that there’s a group of like-minded senators that are gathering to see if we can’t offer up some solutions. And that’s where we are right now,” she said. While Graham has stood firmly behind the president, other participants in the meeting included lawmakers who have begun to express impatience with Trump’s intransigence on the shutdown, including Murkowski and Collins. “He’s trying to get people talking. We’ve got to come up with a baseline and react to it and educate people on the importance of border security at the same time. I think we’ve got to keep it simple,” said Sen. Thom Tillis (R-N.C.), who also attended the meeting. Graham’s initial goal for the Wednesday meeting was to forge an agreement among the Republicans present and eventually to take it to the White House, which is searching for a way out of a shutdown that has become one of the longest in U.S. history. After meeting in Graham’s office, Collins, Murkowski, Portman and Sen. Lamar Alexander (R-Tenn.) met with Senate Appropriations Chairman Richard Shelby (R-Ala.), who hates the shutdown and has met with Trump repeatedly on the topic of border security over the past few months. “There’s a way to get what the president wants and do the least amount of damage to the country as possible,” Graham said afterward. “The wall plus something else” for Democrats. This is a familiar role for Graham, who has tried to broker immigration compromises in the past — but also seen them blown up by the White House and immigration hawks in the GOP. The South Carolina senator attempted to break an impasse one year ago on the expired Deferred Action for Childhood Arrivals, striking a deal with Democrats and a handful of Republicans to protect Dreamers and pour billions into border security. But Trump’s White House and allies on the Hill rallied against the bill, and it failed in the Senate, leaving Democrats wary of ever cutting a deal with the president again and Graham still seeking a new immigration law that’s eluded him for years. Wednesday’s confab comes as Republicans, who have largely supported the president’s budget brinkmanship, are beginning to splinter. Three Republican senators, including Gardner and Collins, have called on the president to negotiate for wall funding after first reopening shuttered government agencies. The meeting followed multiple discussions between Trump and lawmakers Wednesday — first, a visit from the president to the Capitol, where he lunched with Republican senators and pressed them to remain unified against Democrats, and then a meeting between Trump and Democratic leaders at the White House. The discussions yielded little progress. At the White House, according to Senate Minority Leader Chuck Schumer (D-N.Y.), Trump slammed the table and stormed out after House Speaker Nancy Pelosi (D-Calif.) indicated she would not support building a border wall. Earlier in the day, the president said he had not ruled out declaring a national emergency in order to build the wall, a move that would lob another political grenade into a newly divided Congress and spur immediate court challenges. The president is scheduled to visit the border town of McAllen, Tex. on Thursday to showcase what his administration is calling a humanitarian and national security crisis.